For the homeowner, an irrigation system means ending forever the tiresome job of lawn watering while continuing to enjoy lush lawns and beautiful gardens. Custom designed in-ground lawn sprinklers and irrigation systems guarantee that your landscaping will receive regular and adequate hydration at the optimal time of day for the best results. A well cared for lawn and garden with the correct irrigation design in place will have a well-nourished root system and will be better equipped to handle weeds, pests, disease and damage keeping your landscape beautiful and your maintenance costs down. Our experienced professionals will work with you directly to ensure that you understand the entire system and how to run it. We use Hunter Irrigation systems because it allows us to provide our customers with quality products that they can count on to work year after year.  We are also backflow testers and certified by the NYS Dept. of Health ensuring we have the capacity to take care of your irrigation needs.